Each time you set up a new project you choose a method template for it. This defines its process structure, navigation diagrams, templated documents, project control and reporting data collection, guidance hints and tips, reporting settings and attributes, linked resources and reference files. You can even link functionality into your method for report creation etc. This enables you to create many projects to the same pattern to provide consistency to your implementation of a method. You can have as many of these method templates as you want on your server allowing you to set up different starting points for projects of different complexity, in different technical areas or in different languages. Once you have created your project from the method template you can then customise it further. Users often choose to add and remove content to match the particular circumstances within the defined process structure and reporting settings. This powerful capability is unique in the project management world giving you great consistency and fantastic flexibility at the same time. The method template also controls the live navigation of the project determining which documents are provided in each process or via library and index views. A template library of blank files is also provided, these templates may be used multiple times . Your template library is provided live to all projects created from that method template. With all commercial products we provide a free tool called Method Manager which you can use to modify existing method templates or create your own. This puts the power in your hands which has dual benefits, you save implementation costs and are in control of your methods so you can evolve them going forwards. Enterprise Implementations often see highly customised or even bespoke methods. Where often the customer already has a project management process with diagrams and templates but wants to automate this. With Method manager this is a simple and straightforward task. To create your own method is a set of template files and resource locations and a navigation background. Your navigation diagram could be a process diagram, map or aerial photo even…oh and of course Method Manager! 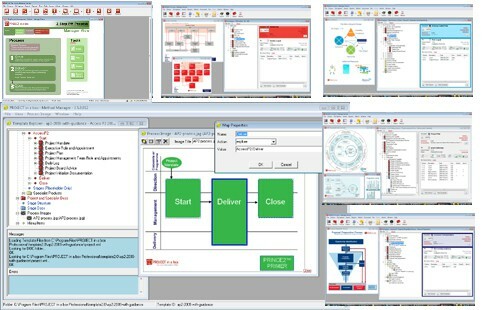 You can read more about Project Management Methodology Customisation here. Community Edition – No ability to create your own method templates or to customise projects once created. Personal, Small Team, Enterprise and Live Edition – Full capability as described here, customise methods, create new methods. Users can also customise projects once they have been created.